Assessments are a key component of all education systems and play a critical role in a student’s learning journey. By measuring student achievement and skill mastery, assessments help students learn, teacher improve instruction, administrators decide how to allocate resources, and policymakers evaluate the efficacy of educational programs. And while I agree with making regular assessments, I cannot support the costly–in billions of dollars and the loss of thousands of hours of instructional contact time–when standardized tests are being forced on students, families, instructors, and administrators across the nation. Compared to World’s Highest System? A Career Assessment might better be served for a college graduate who finds their four year degree and substantial debt can’t get them a “career” or finds them underemployed, or raided by a Department of Education SWAT Team, or in court due to defaulting on their student loan. In the coming years, states will need to make the most significant changes to their assessment systems in a decade as they implement the Common Core State Standards, a common framework for what students are expected to know that will replace existing standards in 45 states and the District of Columbia. The Common Core effort has prompted concerns about the cost of implementing the new standards and assessments, but there is little comprehensive up-to-date information on the costs of assessment systems currently in place throughout the country. This new report by Matthew Chingos [DOWNLOAD ASSESSMENT COST REPORT] fills this void by providing the most current, comprehensive evidence on state-level costs of assessment systems, based on new data from state contracts with testing vendors assembled by the Brown Center on Education Policy. These data cover a combined $669 million in annual spending on assessments in 45 states. The report identifies state collaboration on assessments as a clear strategy for achieving cost savings without compromising test quality. For example, a state with 100,000 students that joins a consortium of states containing one million students is predicted to save 37 percent, or $1.4 million per year; a state of 500,000 students saves an estimated 25 percent, or $3.9 million, by joining the same consortium. Collaborating to form assessment consortia is the strategy being pursued by nearly all of the states that have adopted the Common Core standards. But it is not yet clear how these common assessments will be sustained after federal funding for their development ends in 2014, months before the tests are fully implemented. The report identifies a lack of transparency in assessment pricing as a barrier to states making informed decisions regarding their testing systems, and recommends that consortia of states use their market power to encourage test-makers to divulge more details about their pricing models. The assumption is that educational spending is on “student learning” but, there are many stops in-between funding and the actual student. And, with the increase in Standardized Testing, it’s the publishers that are getting the Lion’s share. In school districts around the country, educational budgets are being cut while business lobbyists push Standardized Testing on cash-strapped schools. Big Corporations and their consultants are making billions of dollars on the backs of public tax payers. Assessment dictates Instruction. It’s important to point out that the corporations (not teachers and schools) that do the assessments dictate the curriculum. If test scores are low, these corporations also have the “solution” for schools to buy and increase the failing scores. Local control is lost. If test scores are too high, assessments are “adjusted”, “normalized”, and, “re-calibrated”. Standards are increased. One-hundred percent is never obtainable. They’re locked-in to the publisher’s continuous improvement model. I agree with the McGraw Hill’s statement on assessment. It’s an integral piece of instruction. And importantly, I think this is best accomplished by the teacher and school….like it is in Finland. I believe that states need to stop chasing Federal dollars and resist being coerced by the lure of big Federal initiatives tied to money. They should focus on local control of the students in their own schools. 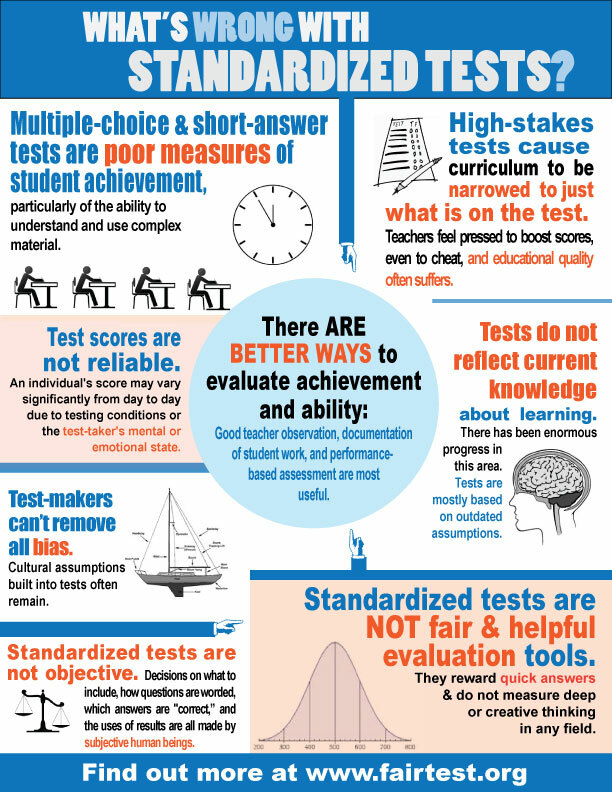 The infographic below demonstrates other problems with Standardized Testing. On the 24th of this month (July, 2013), oral arguments will be heard in a lawsuit that is challenging the ability of the federal government to change the Family Educational Rights and Privacy Act (FERPA) 2011 Regulations. 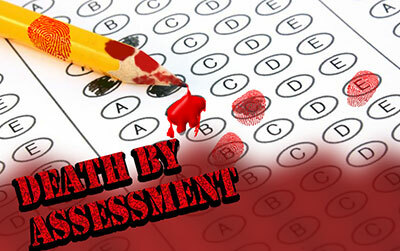 The new Standardized Testing that is part of the Common Core initiative has ALL student data–EVERYTHING about a student from pre-kindergarten through age 20 (eye color and blood type were recently eliminated from the database after public outcry)–into the National Educational Data Model (NEDM) database, which will be (allegedly) accessible by third-parties.